No matter the result next week at the Alabama roulette wheel, Kevin Harvick is moving on to the next round of the Chase after scoring the victory in America’s heartland. Matt Kenseth led the field to the green flag at 2:34 p.m. Debris slowed the race for the first time on the 26th circuit. The next two runs saw quick bursts of green followed by caution. The first saw Aric Almirola get loose, make contact with another car and spin out exiting Turn 4, and Jamie McMurray suffered a right-front tire blowout and slammed the wall in Turn 3 following contact with Alex Bowman in Turn 2. After the race restarted on lap 48, it settled into a long green run that was interrupted by green flag stops lasting from lap 83 to lap 95. During it, the lead went as follows: Kenseth, Joey Logano, Brad Keselowski, Denny Hamlin, Casey Mears and back to Kenseth. Martin Truex Jr. had an issue during the stop that prevented him from getting his car completely full of fuel. As a result, he pitted well before the rest of the field on lap 114. To make matters worse, the caution flew for Josh Wise slamming the wall in Turn 4, trapped him a lap down and the fuel issue still wasn’t resolved. The race went back green on lap 121. After working on Kenseth for a few laps, Harvick got a run on his outside on the fronstretch to take the lead on lap 128. He held the lead for the next 41 laps until Chase Elliott, who spent 15 laps trying to pass him, got a run on him going into Turn 1 to take the lead. He gave up the lead four laps later to pit under green. Carl Edwards took over the lead before pitting and the lead cycled back to Elliott. However, he returned to pit road on lap 176 for a left-rear tire rub that gave the lead back to Edwards. Kyle Larson brought out the fifth caution the same lap after he slammed the wall in Turn 2. The race restarted on lap 184, only for the caution to fly for the sixth time with 77 laps to go for Keselowski getting loose exiting Turn 4, driving through the infield grass and destroying the front end of his car. He also brought out the next caution after he returned to the race with 45 to go and his engine let go on the apron in Turn 3. Austin Dillon exited pit road first by taking just right side tires. Edwards had little trouble passing Dillon on the restart with 42 to go to retake the lead. Regan Smith slowed the race down for the eighth time with 34 to go after making contact with the wall in Turn 3. The race restarted for the final time with 30 to go. 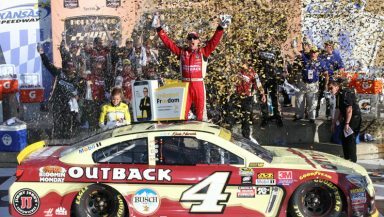 Harvick got the better of Edwards on the restart and drove on to win the Hollywood Casino 400. It’s his 35th career victory in 569 Sprint Cup Series starts, his fourth of 2016, second at Kansas Speedway, 23rd top-10 finish of the season and 11th top-10 in 22 races at Kansas. “I just got two good restarts against the No 19 (Carl Edwards),” Harvick added. “He didn’t have a car quite as close to him, and I was able to break that draft before I got to the middle of one and two and get away from him, so that was pretty awesome. I just needed to go for and that is really the mindset we go into every race in the Chase was to go for, and we did. Edwards led 61 laps on his way to a runner-up finish in his No. 19 Joe Gibbs Racing Toyota. It’s his 17th top-10 of 2016 and 13th in 19 races at Kansas. Logano led two laps on his way to rounding out the podium in his No. 22 Team Penske Ford. It’s his sixth top-10 in 15 starts at Kansas. Jimmie Johnson finished fourth in his No. 48 Hendrick Motorsports Chevrolet. Kyle Busch rounded out the top-five in his No. 18 JGR Toyota. Dillon led two laps on his way to a sixth-place finish, Alex Bowman finished seventh, AJ Allmendinger overcame a speeding penalty to finish eighth, Kenseth led a race high of 116 laps on his way to a ninth-place finish and Kasey Kahne rounded out the top-10. Truex finished 11th, Kurt Busch finished 13th, Hamlin finished 15th, Elliott finished 31st and Keselowski was the lowest-finishing Chase driver in 38th. The race lasted three hours and 28 seconds at an average speed of 133.155 mph. There were 16 lead changes among 10 different drivers and eight cautions for 33 laps. Johnson leaves with an eight-point lead over Kenseth leaving Kansas.